If you watched the Early Show on CBS today, you might have seen me in a cow head band, waving a cow Pez Dispenser in the air. So why do you really care?! WELL, you can get a free entree or free combo meal from Chick-fil-a today only, July 10! 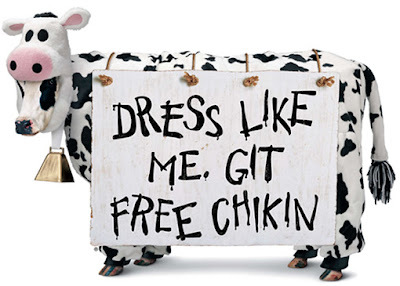 Just wear some kind of cow item for the entree, or dress entirely like a cow for the combo. You can download cow spots at the Chick-fil-a Cow Appreciation Website. I know a lot of you are like, where the heck is there a Chick-fil-a in NYC?! I'd like to give a "shout-out" to my sister Liz, who first introduced me to Chick-fil-a. She now lives in Hawaii, where there are none.